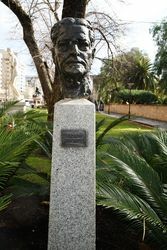 Bust commemorates Howard Florey, the South Australian scientist who discovered penicillin. 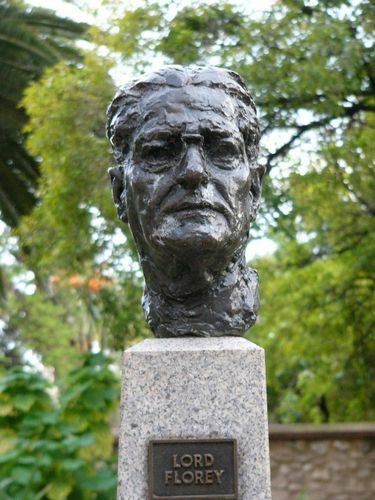 Howard Walter Florey, Baron Florey OM FRS (24 September 1898 – 21 February 1968) was an Australian pharmacologist and pathologist who shared the Nobel Prize in Physiology or Medicine in 1945 with Sir Ernst Boris Chain and Sir Alexander Fleming for his role in the making of penicillin. Fleming first observed the antibiotic properties of the mould that makes penicillin, but it was Chain and Florey who developed it into a useful treatment. Florey's discoveries are estimated to have saved over 6 million lives, in Australia. Florey is regarded by the Australian scientific and medical community as one of its greatest scientists.